I cannot remember where I originally got this recipe from. It’s one of those things that I jotted down because it looked good, cooked from my notes and have made a few times and developed slightly with each one. It’s been popular in my house as I often steam green veg to go on the side of everything but this delivers the veg factor with a bit of a difference and a touch more flavour. I like roasted veg but I find that broccoli and cauliflower in particularly really have their flavours lifted to another level when cooked in this way. Perhaps I’ll throw cauliflower in the next batch. Often, roasting vegetables involves using ten tonnes of oil to prevent them from drying out. This adds a load more fat and a load more calories to your meal. What I love about this recipe is that there’s no oil, instead you add a splash of water to the pan which creates steam and prevents the whole thing from burning or disappearing into a crisp. This would be a great way to do your vegetables with or without the dressing. 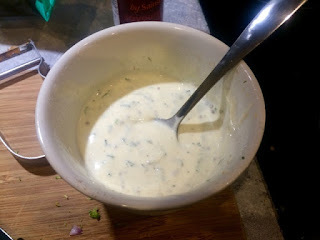 However, the dressing that goes with this dish is the real highlight, it’s so versatile that I find myself making it on it’s own for use with other things. I often serve fish with it and salmon in particular works brilliantly. 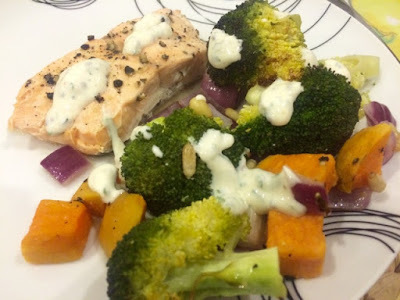 The day after the dinner pictured above I drizzled some of the dressing into a packed lunch with salmon and cous cous and it was so tasty I could have eaten twice the amount. 2. 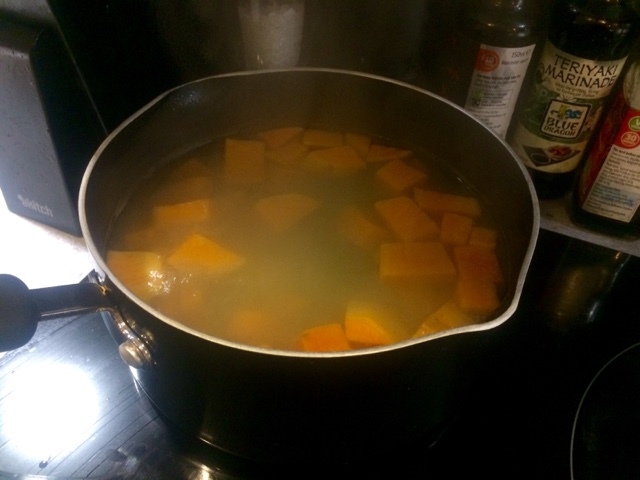 Par boil sweet potato for 5-6 minutes in salted water. 3. 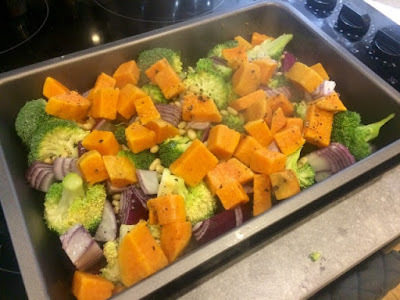 Scatter all of the veg and nuts in a deep roasting pan with the drained cooked sweet potato. Season with salt and pepper. Add a splash of boiling water from the kettle. Place in the oven for 20-25 minutes until veg is roasted and water has all evaporated. 4. 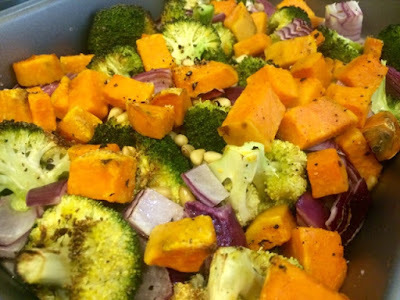 While the veg is roasting, prepare the dressing. 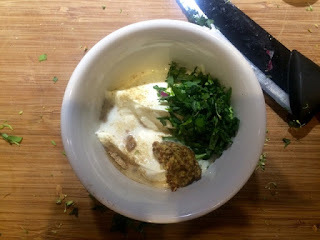 Place all the ingredients into a small dish, mix thoroughly. 5. Remove vegetables from the oven. 6. Dish up as a side with fish or meat and drizzle over a little of the dressing.